Capricorn Research exists for one reason only – to prove astrology to as many people as possible. This whole website is devoted to this aim and focuses on two different principle directions. The Capricorn Astrology Research Project has drawn on the charts of over 20,000 public figures to show that there is a statistically proven connection between the planets positions and human behaviour. The other is by delineating the charts of hundreds of individuals to show the powerful connection between these charts and the characters concerned, but particularly to prove that the most important events in their lives were triggered by the movements of one planet. The biggest hindrance to Astrology becoming recognised as a science is astrologers themselves. There is so little consensus around method and what different astrologers are prepared to use in order to find a reason for their predictions or insights. We have the 10 planets that everyone knows from primary school. We know that transits of planets to important points in our charts will trigger events in our lives or at least inner changes that would influence such events. By common consent a transit impacts when a moving planet is within 1 to 1 and a half degrees of a natal planet. The Sun, Moon, Mercury, Venus and Mars are all relatively fast moving so their transits are going to last for 2 or 3 days at most. Jupiter, Saturn, Uranus, Neptune and Pluto move much more slowly and their transits can last for anything from a few months in the case of Jupiter to a couple of years for Pluto. So it goes without saying that this latter 5 will have a more powerful and lasting effect than the others. If we restrict ourselves to the transits of the five slower ones to the five faster ones plus the Ascendant, this means that at any one time 90 degrees or a quarter of the Zodiac is being covered by a transit ( 5 times an orb of 3 to 6 different points = 90 ). If we also restrict ourselves to the most powerful and commonly used aspects, the conjunction, opposition and square, this multiplies the coverage by four times ( there are two squares ), to 360 degrees. So just going by chance alone, any moment in a person’s life will be covered by one or other of these transits. So if for example, someone becomes Prime Minister, an astrologer can explain this quite authoritatively by saying that’s because Jupiter was conjunct their Sun at the time, and we would all nod our heads wisely in agreement. We would be impressed because the chances of Jupiter being conjunct the Sun at such a moment are about 1 in 120. The trouble is, lots of astrologers can make a decent case for most of the slower 5 planets being conjunct, opposite or square any of 6 natal points to explain this person’s rise to the top job, despite the fact that this creates a situation that is the same to pure chance on its own. In many cases, astrologers will approach the subject of explaining events in people’s lives with a vast array of predictive tools, going way beyond the major aspects of the 5 slower movers. The rise in the use of midpoints is an example of this. We no longer need to prove a link by pointing to an angular relationship between one planet and another. Midpoints allow us to include empty spaces in the Zodiac that happen to be equidistant from one planet to another. Capricorn Research does not mean to trash the use of midpoints, its just needs pointing out that every pair of planets have midpoints. So 10 planets creates 45 possible midpoints. Other astrologers will use Fixed Stars or Asteroids and authoritatively say that an event is because a transiting planet has made an aspect to one of them. There are billions of stars and asteroids obviously and if we allow ourselves to use these methods, where do we draw the line ? Another problem is that many astrologers are quite prepared to use obscure minor aspects to back up their assertions without realising that this means that by increasing the number of options we give ourselves we are creating a situation where our prognostications become more and more meaningless. There are many examples that this approach has spiralled out of control. A recent claim was that the rapper “ 50 Cent “ lost 17 kilos to play an acting part because his progressed Sun was sesquisquare the transiting Ceres. This is so bizarre, its hard to know where to start. Progressions are a method of projecting a natal chart into the future, based on the principal of one day equalling one year. This is a symbolic method connected to the daily movement of the Earth’s rotation and its annual voyage around the Sun. Progressions are a much used and highly respected method although they are generally felt to be indicative of an individual’s inner development whereas transits are more to do with outer events. The problem with discussing inner development is it inevitably requires some level of subjective judgement whereas we can prove the existence of events. The sesquisquare is an angle of 135 degrees. If we add sesquisquares we are inevitably decreasing our capacity to make an observation that is more reliable than chance. But of course, its not just sesquisquares, and anyone using this aspect would also have trines, sextiles, semi sextiles, semi squares, inconjuctions and septiles in their pallet box. Ceres is an asteroid, so again where do we draw the line. It’s not even 50 Cent’s natal position of Ceres, its the transiting one. Anyone with a GSCE in statistics would drive a coach and horses through this explanation of weight loss. With stuff like this being bandied about, its no wonder astrology is not being treated seriously. Obviously there is no one way of looking at astrology, there are as many valid viewpoints as there are astrologers with different charts of their own. And every one of them have devised methods that work for them, so they have to be respected. But if we want serious consideration of our subject we have to narrow our focus. For this purpose, Capricorn Research has chosen to deliberately focus purely on the transits of one planet, Pluto. The vast majority of the articles on this website deal exclusively with the transits of Pluto to the natal Sun and Moon of the people concerned. Aspects used are similarly restricted to the conjunction, opposition and squares. In an average lifetime this is likely to occur about 3 times. As each has a time period of 1 to 2 years we are talking about something that has a chance occurrence of approximately 1 in 15. If it can be shown that Pluto’s transit to the Sun or Moon consistently fits with the major watershed turning point in a person’s life than we are really onto something. Pluto has been chosen because its transits do precisely that and are more clearly connected to sudden dramatic changes in circumstances than that of any other planet. It may be small and a long way away, but it is an absolute astrological monster causing more trouble than any other planet. It really is the nuclear option. We should have known that it would be when we look at the chart for the day of its discovery. We can immediately see the challenging tensions just by looking at the number of difficult square aspects. The Capricorn Research Project has 20,641 charts which contain a total of 65,697 squares. As this is such a large sample we can be fairly confident that the average number of squares per chart is about 3.2. The Pluto discovery chart has 7. There are also two T squares, one between the Sun / Venus conjunction opposite Neptune square to an apex Jupiter, but perhaps the more significant is the one that Pluto itself is involved in. Pluto is opposite Saturn with a T Square apex of Uranus. A more difficult introduction to the world is hard to imagine. It means that its energy is going to be very painful, challenging, onerous and demanding ( opposite Saturn ) and explosive, disruptive, subversive and generally causing trouble ( apex Uranus ). From the perspective of astrological symmetry, the discovery of Pluto helped improve a system that had begun to look a bit odd over the previous 150 years. Ever since man had acquired the consciousness to observe movements in the night sky and realise the impact on life on earth, the planetary rulerships had a certain balance. There were 7 of them known and visible to the eye. 7 planets into 12 signs of the Zodiac doesn’t go but when we take into account that the Sun and Moon are fundamentally different from the other 5 it works fine. The Sun and Moon were ascribed rulership of 1 sign each, Leo and Cancer. The other 5 were given authority over 2 signs each. Mercury had Gemini and Virgo, Venus had Taurus and Libra, Mars had Aries and Scorpio, Jupiter had Sagittarius and Pisces and Saturn had Capricorn and Aquarius. When Uranus was discovered in the late 18th century it was given Aquarius. With hindsight it always seemed a bit odd that this rebellious sign should be ruled by Saturn anyway. Neptune’s discovery seemed a perfect fit for Pisces so we were left with each planet having one sign apart from Venus and Mars that had two. When it came to Pluto’s discovery there was no question about which sign it would rule. The Lord of the Underworld would have to take Scorpio – the most natural fit of any of them. So now only Venus rules two signs and if we want perfect symmetry we should expect another planet to take Libra. A number of candidates have been put forward for this role including Charon but there seems no consensus as yet. Maybe there’s still another one out there to be discovered or given planetary status. So Scorpio is ruled by Pluto and appropriately the Moon in the discovery chart is in that sign. The Moon is also in square to Mars adding to the explosive tension in the chart. Pluto was discovered by American astronomer, Clyde Tombaugh. With the Sun in Aquarius in trine to Moon in Gemini, Tombaugh fits the description of a scientist who makes an important new discovery. The fact that Pluto is in exact conjunction with his Moon and therefore also trine his Sun, shows what the discovery was. The naming of Pluto was very interesting. Tombaugh’s discovery was made at the Lowell Observatory in Flagstaff, Arizona, which was founded by the astronomer Percival Lowell who formed the beginning of the effort that led to the discovery of Pluto fourteen years after his death. Planets are generally named after Roman gods and Constance Lowell, Percival’s widow insisted that it be called Zeus or Percival or Lowell after her husband and then rather bizarrely Constance. All these names were politely rejected and the name Pluto was chosen by an 11-year old British school girl named Venetia Burney. Pluto was the Roman god of the underworld, the same as Hades in Greek mythology. It also matched the first initials of Percival Lowell and Pluto’s astronomical symbol, ♇ is a monogram of this. Pluto’s astrological symbol is . We already had a Zeus figure in Jupiter, so that was never going to stick and if it had been called Constance we would be living in a very different world now. The connection with the underworld is very appropriate because Pluto’s actions have always been characterised as sudden unexpected eruptions that come from the deepest levels of our unconscious selves. Pluto was discovered at a time when there were massive changes in science and in our whole conception of reality. Ernest Rutherford was credited with first “splitting the atom” in 1917 and under his leadership the neutron was discovered in 1932 and with the first experiment to split the nucleus in a fully controlled manner. When someone is born, the position in the Zodiac of the Sun at that moment becomes extremely important and any planets transiting that point have a major impact on that person’s life. When a planet is discovered the degree position that it holds will have an extremely strong affect on the world and any transits to it will produce a powerful demonstration of that planet’s own energy. Pluto was discovered at 18 degrees Cancer and it was opposite Saturn. 15 years later, Saturn had moved halfway round the Zodiac to 18 degrees Cancer and this triggered the single most important and frightening event in the whole of human existence, the atomic bombing of Hiroshima and Nagasaki. As if to emphasise this, the Moon was at the exact same point at the time of the dropping of the Hiroshima bomb. 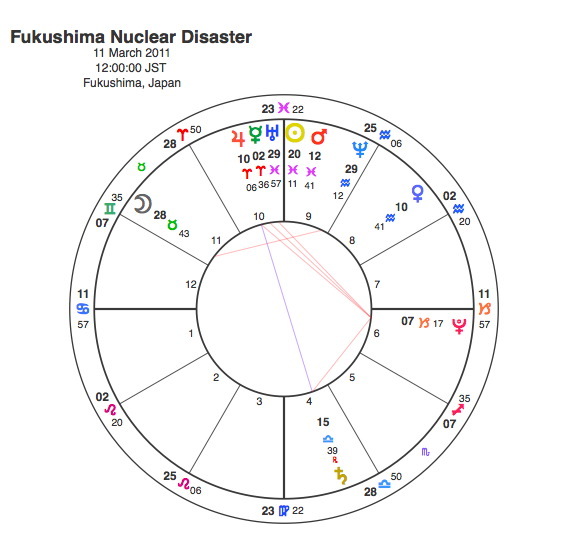 In the fifteen years since its discovery Pluto had moved to 10 degrees Leo, conjunct the Sun in the Hiroshima chart. This placing also means that it creates a T Square with the chart of its own discovery, opposite Mars and square the Scorpio Moon. This combination makes a transit of unbelievable power, triggering all the latent threat of the 1930 chart. Its no wonder the world changed for ever on August 6th 1945. For Nagasaki three days later, Pluto and Saturn were obviously in the same place and Pluto was still conjunct the Sun. 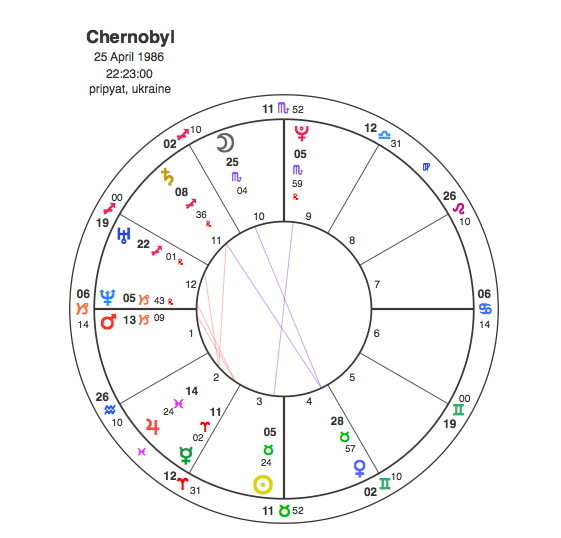 The only planet that could move significantly in such a short timespan is the Moon which had moved to 29 degrees Leo exactly opposite the Sun in the 1930 chart. The bombings of Hiroshima and Nagasaki brought an abrupt end to the 2nd World War in Japan. At least a quarter of a million people were killed, about half of that number instantly on the day. It stands even 70 years later as the most horrific example of the capacity of mankind to descend into psychosis. The only positive thing that can be said is that the evidence of the actual destruction in Japan has so far helped to avoid any more nuclear weapons being used. Although we have come close. Russian leader Nikita Khrushchev proposed the idea of placing Soviet nuclear missiles in Cuba to deter any future US invasion attempt and a secret agreement was reached and construction of several missile sites began in the late summer. 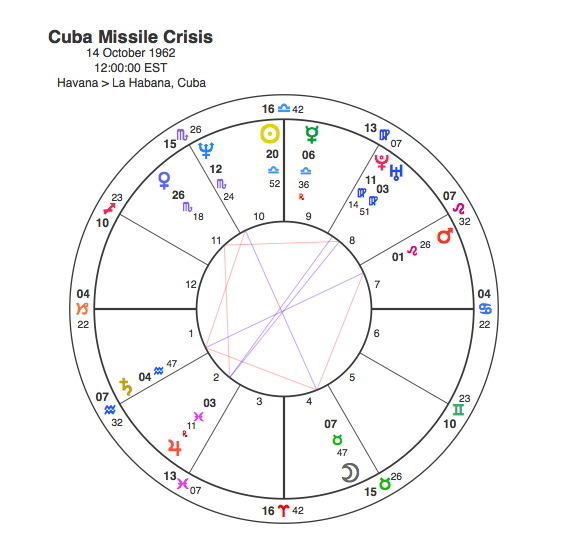 These preparations were noticed by the Defense Intelligence Agency, and on October 14 the United States considered attacking Cuba via air and sea, but decided on a military blockade instead. The US demanded the dismantlement and return of Soviet weapons back to the USSR. The Kennedy administration expected a military confrontation but the standoff ended October 28, 1962, when Kennedy and United Nations Secretary-General U Thant reached an agreement with Khrushchev. This is another very difficult chart with an effective Grand Cross between the Moon, Mars , Saturn and Neptune. There is also another T Square with an opposition between Jupiter and Uranus focusing onto an apex Venus in Scorpio. The chart has twice as many oppositions and squares as the expected average. It is relevant to point out that Neptune is conjunct the Moon of the 1930 discovery chart. Pluto is also in aspect to the 1930 Moon, but fortunately the aspect is a benevolent sextile which is probably what save due from World war 3 at the time. But it hasn’t just been nuclear weapons that has been a Pluto issue. Nuclear power has become a significant energy resource producing about 13% of the world’s electricity and there are nearly 500 operational nuclear reactors. Unfortunately there have been some major accidents. The worst in British history was the Windscale fire of October 1957. The accident occurred when the core of a nuclear reactor caught fire, releasing substantial amounts of radioactive contamination into the surrounding area. The fire burned for three days and there was a release of radioactive material that spread across the UK and Europe. It has been estimated that the incident caused 240 cancer cases. There are a couple of similarities between the Windscale chart and the Cuba chart. The Moon is in early Taurus opposite Neptune and in trine to Pluto. Pluto is at 1 degree of Virgo, opposite the Sun / Venus and conjunct Neptune in the 1930 chart. It is noted that another accident happened just 11 days previously at Kyshtym in the Soviet Union. Its always very difficult to verify but estimates of the number of people that died due to cancers caused by this explosion range from 200 to several thousand. Pluto was at the same point in the Kyshtym and Windscale disasters. The next accident was at Three Mile Island where a partial nuclear meltdown occurred on March 28, 1979 in the United States, the worst accident in U.S. commercial nuclear power plant history. The partial meltdown resulted in the release of unknown amounts of radioactive gases and radioactive iodine into the environment. Epidemiological studies have deduced many instances of cancer from the accident, but they cannot be proven. 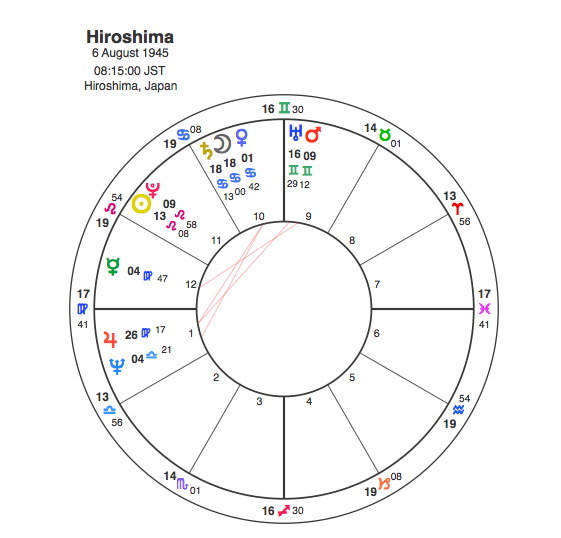 The chart for Three Mile Island is significant in that Pluto had moved to 18 degrees of Libra, making its first transiting aspect to its own position in the 1930 chart, a square. By far the biggest nuclear power disaster however was Chernobyl in April 1986 when an explosion and fire released large quantities of radioactive particles into the atmosphere, which spread over much of the western USSR and Europe. The battle to contain the contamination and avert a greater catastrophe ultimately involved over 500,000 workers and cost an estimated 18 billion rubles. During the accident itself 31 people died, and long-term effects such as cancers and deformities are still being accounted for. This is another difficult chart based around two oppositions. The Sun is opposite Pluto and the Moon is in Scorpio opposite Venus. Pluto is at 7 Scorpio, closing in on the 1930 Moon position and the Mars square aspect. The last of these accidents was the Fukushima Daiichi nuclear disaster when the plant was hit by the tsunami triggered by the Tōhoku earthquake and began releasing substantial amounts of radioactive materials beginning on 12 March 2011. In August 2013, it was stated that the massive amount of radioactive water is among the most pressing problems that are affecting the cleanup process, which is expected to take decades. A 2013 WHO report predicts that for populations living in the most affected areas there is a 70% higher risk of developing thyroid cancer for girls exposed as infants, but again the real cost in human terms is hard to measure. This is another chart with a very difficult and explosive planetary pattern, a T Square between Jupiter, Saturn with an apex Pluto. It is also important to point out that Pluto here is conjunct the 1930 Saturn. 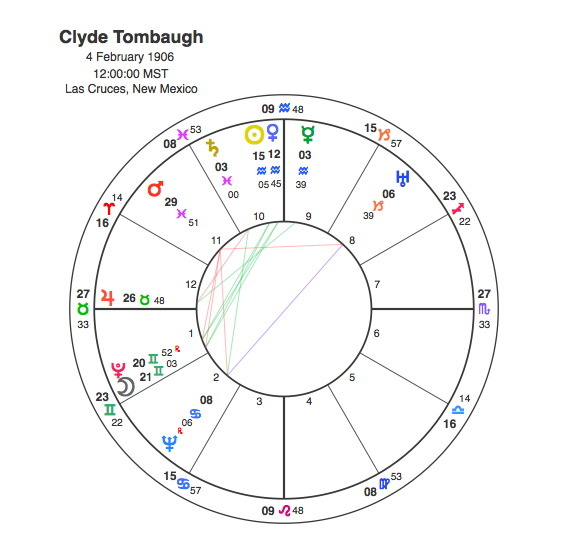 Every chart in this collection has the Moon in Taurus or Scorpio or some kind of Moon / Pluto relationship and they all have significant connections to the Pluto discovery chart of 1930. Pluto’s planetary status has been called into question by many so called clever scientists. Capricorn Research would challenge all of them to provide their own birth data so their own atomic transformations could be pointed out by the transits of this ” non ” planet. And if they want to do something of real use to mankind, they could hurry up and discover a new peaceful planet ruling Libra, which would give us all a break. I noticed that it’s been 84 years since the discovery of Pluto and that’s near a Uranus return. I wonder about Pluto’s opposition to it’s discovery date soon. It would be lovely to discover that new planet! What are the chances! That’s interesting. I hadn’t picked that up. Could explain the Plutonic times were having. So Pluto reaching 18 Capricorn soon looks really scary and explosive. ..